Ive been desperately wanting to get myself a nice brew stand in order to eventually consolidate my entire brewing process into one unit. 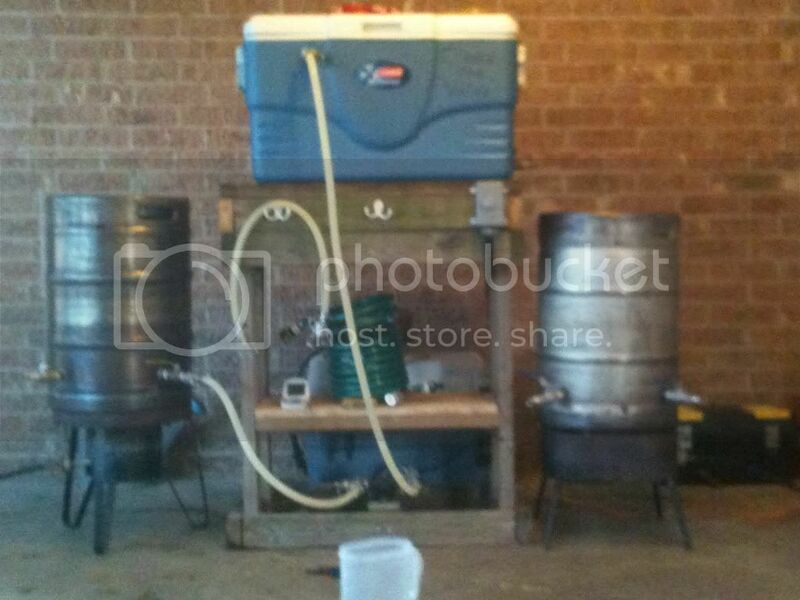 Been doing some thinking, and Ive seen quite a few people that have built wooden brew stands. I have easy access to a full woodshop and somebody who would be willing to help me construct it. So all-in-all, im thinking that a wooden stand may just be much more practical for me. Anybody have any good designs or personal experiences they would be willing to share? Also, my dad works for a company that specializes in fluid technologies, so I also have access to all kinds of pipes, hoses, pumps, heat-exchangers, and all that stuff at a pretty cheap cost if I need it. So yeah, if anybody has some good ideas for a design... or input regarding making it a certain style, like RIMS or HERMS... Id really love any advice I can get! Thanks! I don't have a design to share but it really comes down to your own process. If you have access to "custom building" your own. Design it to fit your process. Take a brew day and study your own process and look at what is efficient and what is not. That should give you a starting point. Turn it into a beast you are willing to show off and produce beer with. Not specifically in that order. Post pics when it is done, so we can drool over it. It isn't much to drool over, but this is my Jew-tus 10 (yes, I'm a heeb). I repurposed the wood from my 3 tier stand earlier this year. This will have to serve me until i can step up to the BREWTUS 10, ahem. The pump is wired to a waterproof switch on the top of the stand. I whirlpool continuously through the CFC (want a plate chiller) during the 70 min boil. I cool to 140F, then pump directly into my carboys in my freezer on wheels. There is a digital thermometer in the HLT and in the inlet side of the pump to monitor the whirlpool temp. If I had your access to pumps I would have 2. Here is my gravity fed 3-tier system, it's nothing fancy. 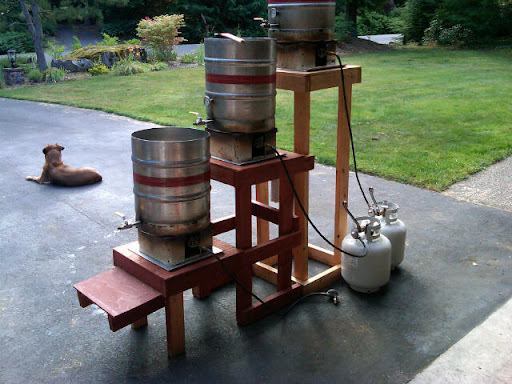 The stand (and burners and keggles) came as-is from a guy who was selling all of his brewing gear. The shelf at the bottom is convenient for resting the chiller and I can still gravity feed into a carboy. The burners rest on baking sheets (the kind with a layer of air in the middle) to keep a little heat off of the wood, but they're probably not needed. I like that alot tom! I would love to build something like that. So sick of lifting heavy coolers, hot and heavy kettles. Have no metal working skills but some modest wood working ones. I haven't found a need to change it at all. It's just 2x4s and 1/2" plywood, in two pieces so it is easier to move. The 2x4's that support the middle tier overlap the legs on the higher tier to give it side to side stability. The legs on the upper tier alternate the way the 2x4s face to give it more stability. It's a pretty good design. yeah. so the top teir is separate from the bottom two it looks like. Dog is cute to. Nice! That looks alot like my old 3 tier but with a direct fire MT. I loved it! I made mine from pressure treated and and it served me well for many years. My wife absolutley hated though. She said it was an eyesore. I thought it was beautiful. lol! There was alot of trial and error, and alot of sleepless nights conceptualizing but I am pretty happy with the setup. I used "Sharkbite" fittings I bought at Home depot. This allowed me to use CPVC plumbing so was able to change things around till I got it right. Still ended up with alot of spare parts! 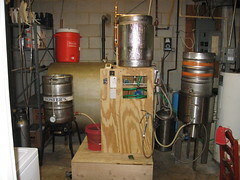 I built my RIMS using 2x4s and plywood for the mash tun and counterflow wort chiller- basically a2'x2'x4'box set on a wider base. HLT and BK burners stand alone about 24" off the deck. Two March pumps (1 for transferring strike/sparge and recirculating; the other pums boiling wort through the CFWC and into the carboy. Mash tun gravity feeds the BK. I made a RIMS heater using about a 1 foot peice of 1.5" copper pipe fitted with a hot water heater element. This is wired to a SS relay controlled by a PID (Omega Engineering #? but can look up if interested). Word of caution: make sure you wire the heater in a way that the pump MUST be running when heat is applied, or you'll burn up the element real quick! I have not figured out how to post pics yet, sorry. This will have to serve me until i can step up to the Brutus 10, ahem. OK so why am I getting an"X" where the photo should be? Do I have something set up wrong? It might be that you can't link from flickr. I tried all of the different locations for it I can find and it still comes up blank. I can get a thumbnail to show up (above) by right clicking on it and copying the image location, but it doesn't let me on the full size pic. Maybe someone else has more experience with flickr? <edit> maybe grabbing the link from the page source will work? Better anyway.